So a while ago we posted a write up on a very long fifth wheel trailer (which is still the matter of some debate, with some people saying its the longest, some saying it must be shopped, but we’re waiting until we see all the evidence until we make a final call on it and post the answer [with evidence either way]). 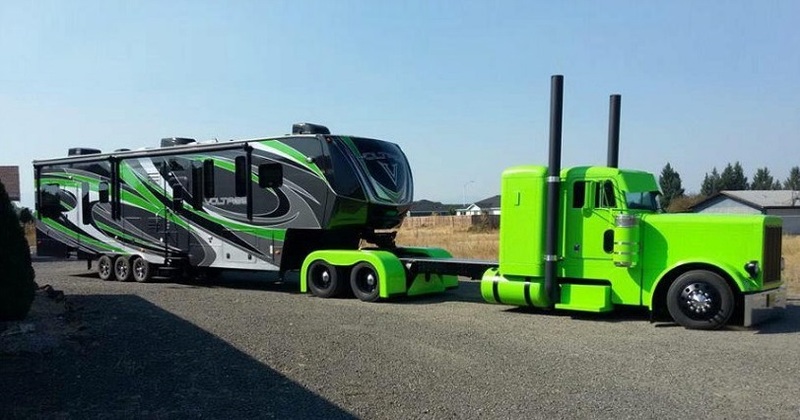 But one of the Plains Trains page members who responded to it shared his own custom semi truck – fifth wheel trailer combo: this one in the pictures. It’s Michael Atwoods’ lime green Peterbilt.